This fact sheet describes the development of a specialized driver model and software for work zones – the FHWA Work Zone Driver Model v1.1. Freeway work zones can have significant operational impacts, accounting for nearly 24 percent of the annual non-recurring delay in the United States.3 With many freeway segments reaching (and surpassing) their 50-year design life, the number of freeway work zones in the United States is projected to increase. So they can design and plan work zones that minimize delays, planners and engineers need accurate simulation tools to predict the operational impacts of work zones. Microsimulation has the potential to accurately predict work zone impacts, because it models individual vehicle movements at the trajectory level. Existing microsimulation software packages, however, are not equipped to simulate freeway work zones, because their algorithms do not account for changes in car-following behavior (e.g., acceleration patterns) known to exist as drivers approach and traverse freeway work zones. Before practitioners can accurately predict work zone impacts using microsimulation, a microscopic work zone driver behavior model is required. FHWA and the U.S. Department of Transportation (USDOT) Volpe Center developed a work zone car-following model and DLL file that interfaces with existing microsimulation tools, enabling more accurate simulation of car-following through freeway work zones. The purpose of this project is to provide practitioners at transportation agencies and in private industry with a tool that can better predict the operational impacts of freeway work zones. Through a technique known as cross-validation, the microscopic models were trained and tested against separate validation data from I–95, ensuring that the acceleration and deceleration behavior were accurate and not over-fit to the empirical data. 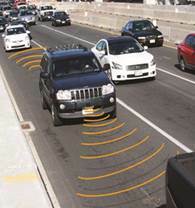 The software was developed, interfaced with VISSIM, and tested along freeway work zones in Massachusetts. The Volpe Center worked with MassDOT to test and validate the work zone software against field data collected for the I–91 work zone in Springfield, MA. Performance measures were selected based on how State agencies currently analyze work zone traffic management plans (i.e., location and length of queues and travel times). Field data provided by MassDOT supplement the data collected with the IRV. 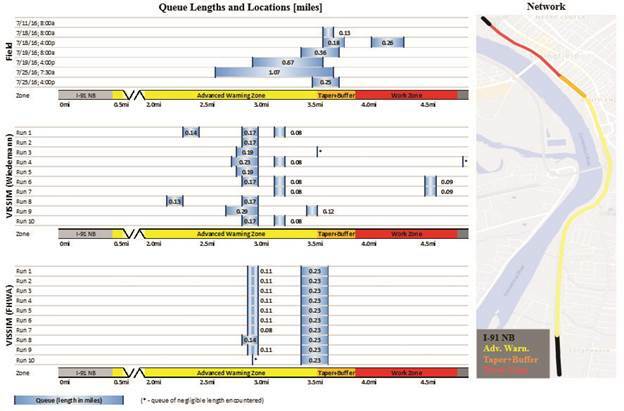 The FHWA Work Zone Driver Model predicted travel times and queue locations more accurately than the calibrated microsimulation software package using suggested model parameters. Opportunities to improve the work zone software were noted, including algorithms to reproduce additional variations in driver behavior, currently simulated through microsimulation models’ stochastic elements and random number generators. The FHWA Work Zone Driver Model v1.1 is now available as part of the FHWA Driver Model Platform v0.62 (available for download on the OSADP1). The model is being continually upgraded; new versions will be released annually. FHWA. “Open-Source Application Development Portal (OSADP)” (website). Washington, DC. Available online: https://www.itsforge.net/, last accessed October 20, 2017. FHWA TechBrief (2018). “Federal Highway Administration (FHWA) Work Zone Driver Model – Version 0.6”. In production. FHWA. “Facts and Statistics – Work Zone Mobility.” (website). Available online: https://ops.fhwa.dot.gov/wz/resources/facts_stats/mobility.htm, last accessed October 20, 2017. Lochrane, et al. “Understanding Driver Behavior in Work Zones”, Public Roads, vol. 76, no. 5, March/April 2013. FHWA. “Research Data Exchange” (website). Washington, DC. Available online: https://www.its-rde.net, last accessed October 20, 2017. Berthaume, et al. (2017) “Variations in Driver Behavior: An Analysis of Car-Following Behavior Heterogeneity as a Function of Road Type and Traffic Condition.” Submitted to the January 2018 TRB (paper 18-06005). Lochrane. (2014). “A New Multidimensional Psycho-Physical Framework for Modeling Car-Following in a Freeway Work Zone”, PhD diss., University of Central Florida. Berthaume. (2015). “Microscopic Modeling of Driver Behavior Based on Modified Field Theory for Work Zone Application”, PhD diss., University of Massachusetts. Berthaume, et al. (2017) “Validating the Performance of the FHWA Work Zone Model Version 1.0 in VISSIM: A Case Study Along I-91 in Springfield, Massachusetts.” Submitted to the January 2018 TRB (paper 18-05790).